Endeavour Automotive is days away from opening a new Lotus franchise in Colchester as the British sports car maker continues its expansion plans under new owner Geely. The London-based AM100 Hyundai and Volvo franchisee has been issuing posts via newly-established social media accounts in anticipation of the opening, which will take the brand’s franchised retail network up to 20 locations. 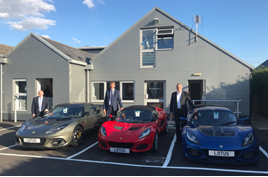 Adrian Wallington, Endeavour Automotive's managing director, told AM: "We’re incredibly proud to be opening the new Lotus franchise in Colchester. This iconic sports car business will be a welcome addition to the Endeavour customer offering, and continues our successful relationship with the Geely Auto Groupbrands, including the LEVC electric taxi franchise we opened in Chiswick last month. "The quality and customer focus of the Geely brands reflects our own values, and our investment in new sectors demonstrates the confidence we have in the fantastic products already available and which are in future development. "I was very impressed when I visited the factory myself just a few weeks ago, and with the news this week that Phil Popham has been appointed to lead the brand, I can say for certain that it’s a truly exciting time to be involved with Lotus." Currently, Stanstead’s Castle Sports Cars are the only official Lotus Dealer in Essex, having started its relationship with the brand back in 2001, but that will change when the new facility opens 32 miles to the West. 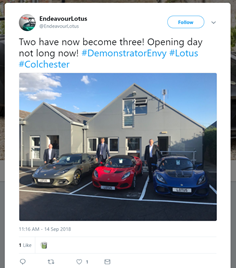 Recent posts from a new Endeavour Lotus account started on Twitter last month have shown images of demonstrator cars arriving with the franchised retail group. The latest post – issued via the social media platform today – showed Wallington alongside a trio of Lotus sports cars.